“Humans are just not that important,” says Dr. Randall Milstein, NASA Astronomer-in-Residence and instructor of HC 407: Comparative Planetology. It’s a humbling statement, but one fitting when viewing Earth and humanity from a universal context. That’s exactly what students in the spring section of HC 407: Comparative Planetology will spend 2 hours per week discussing and discovering as Dr. Milstein guides them on a journey exploring our Solar System and beyond. 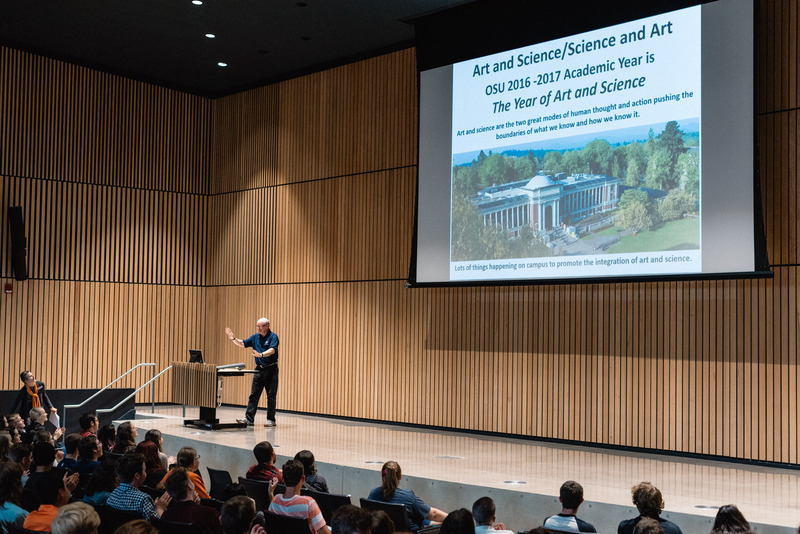 Dr. Milstein teaches a number of colloquia in the Honors College, ranging from Comparative Planetology to Science of Art/The Art of Science to Sacred Places and Astronomy. His classes incorporate his own personal background – Dr. Milstein holds an Associate of Fine Arts in Photography, along with three other degrees (including his Ph.D.) in Earth Science and Geology, having completed his doctoral research in astrogeology. Dr. Milstein values what he calls a “Renaissance perspective” in himself and in students. In order to be the best scientist or engineer one can be, he thinks, one must also indulge their creative tendencies from time to time. Research by leaders in creativity studies supports this notion; in one study, scientists with diverse interests in both their scientific field and the humanities were found to be more successful than colleagues engaging in fewer, less integrated nonscientific activities. When he isn’t teaching, researching or serving as Astronomer-in-Residence for the Oregon NASA Space Grant Consortium, Dr. Milstein enjoys reading, spending time outdoors, participating in an annual talk on Star Wars and Star Trek, attending comic and pop culture conventions and photographing dancers, further blending his passions for science and the arts. It’s these passions Dr. Milstein sees reflected in honors students who are actively engaged in their learning, constantly asking questions and teaching their instructor. “Every day, I learn something new,” he says. Dr. Randall Milstein instructs five honors colloquia classes: Comparative Planetology, Crises, Catastrophes, and Cataclysms in Earth’s History, Science of Art/The Art of Science, The Science of Science Fiction and Sacred Places and Astronomy. Be sure to register for one of these colloquia next term!